If you haven't had a chance to view the Star Wars: The Old Republic, Threat of Peace web comic, they just released Issue #2! Threat of Peace is a collaborative effort between BioWare, LucasArts and Dark Horse Comics. There is a new issue released twice each month. The web comic is a "dramatic and exciting introduction to The Old Republic time period and many of the characters who appear in the game." What game you ask? Star Wars: The Old Republic by Bioware; a new Massive Multiplayer Online Role Playing Game (MMORPG or MMO) that is due to be released at an unknown time and is currently in testing. Visit the official site for more information. 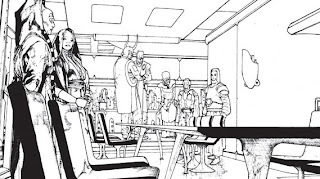 Currently we are on Act 1: Treaty of Coruscant, Issue #2. These comics are short but sweet; each issue thus far is 6 pages packed full of energy. It even looks like we have the basic model for Darth Vader's armor in Issue #2. Let me know if you see what I saw!